Who doesn’t love zucchini noodles? They make a perfect base for ever-popular vegan bowls, too. We love them not because there’s anything wrong with regular pasta noodles. But in the same way as cauliflower “rice” has gotten to be such a big thing, it’s just another very cool way to eat more veggies. 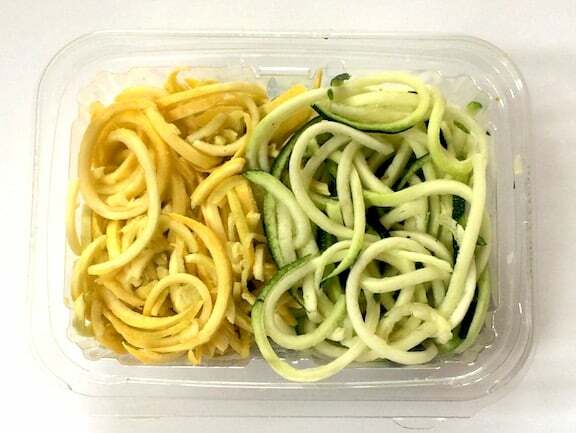 But what if you don’t have a machine — how do you make zucchini noodles without a spiralizer? You buy them already spiralized, that’s how. 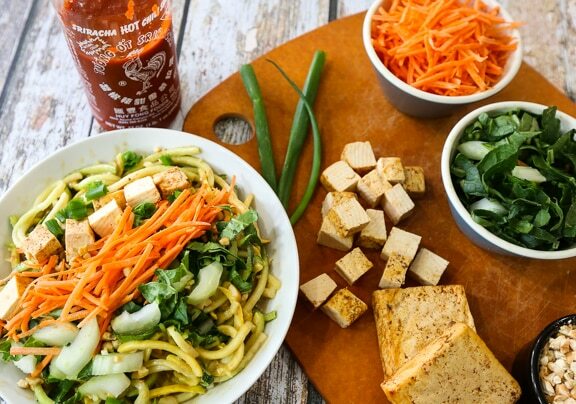 And then this peanut satay noodle bowl will be ready in a flash. I love zucchini noodles, and I even have a spiralizer. But I’m so lazy that I hardly ever use it. I mean, I have to climb onto a step stool, get it down from a cabinet, then after using it, almost the whole thing needs to be washed and takes up the entire dish drainer. Then, of course, I have to climb onto the step stool to put it back. No wonder it sits there mostly unused. So, imagine my delight when I discovered spiralized zucchini (and a bunch of other spiralized veggies in my supermarket’s produce section. Granted, buying these prepared veggie noodles is a bit more expensive than buying a couple of zucchini and spiralizing it yourself. But for me, it means saving two trips on the godforsaken step stool, and cleaning up afterwards! Zucchini noodles are so tasty with peanut sauce. And you guessed it — we’ll be using prepared peanut satay sauce, too. I figure the little extra I’m spending on the prepped zucchini noodles, I’m saving on getting all the ingredients needed to make satay sauce from scratch. The nice things about bowls is that you don’t need to obsessively measure ingredients. You can also substitute other vegetables for the ones we use here. Just arrange them artfully (or sloppily, we won’t tell) on the base on the zucchini noodles bathed in satay sauce, serve, and enjoy. 1 Remove the zucchini noodles from the packaging and combine in a mixing bowl with enough satay sauce to coat generously. Divide between two wide shallow bowls. 2 If you’re using regular bok choy you’ll only need a couple of stalks. Either way, rinse the bok choy or baby bok choy, pat dry, and slice thinly. 3 Cut about half of the tofu into dice. Slice one or two scallions thinly. 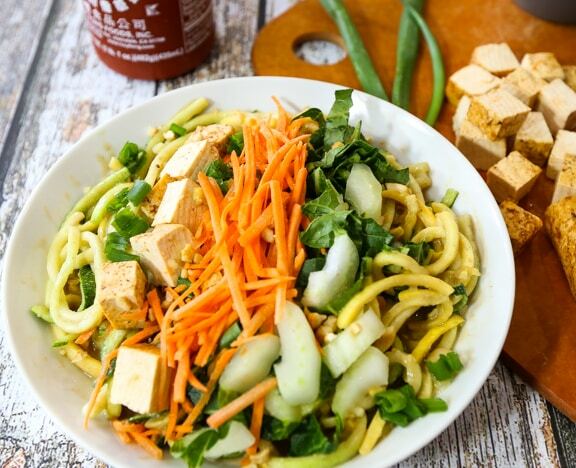 4 Arrange the bok choy, tofu, and grated carrots over the zucchini noodles. Sprinkle with chopped nuts, if using, and pass around hot sauce if you’d like. 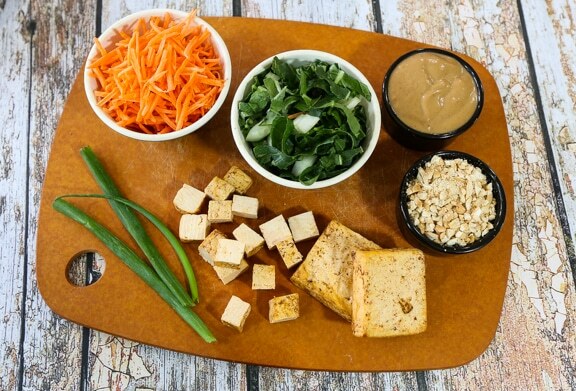 Note: You’ll have quite a bit of bok choy (if using a regular bunch), scallion, and carrot from this meal; plus a small amount of tofu and some satay sauce. Use them to make a tasty raw salad or a quick stir-fry. Add whatever you’d like to the mix — leafy greens and/or tomatoes to a salad; a grain to the stir-fry. See more of our Shameless Shortcut Recipes and Vegan Food Hacks.